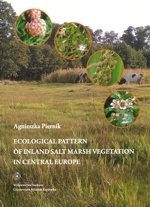 The book presents the results of the research on plant-environment relations, both in natural and anthropogenic inland saline areas in Central Europe. The research covered most of the existing sites of inland halophytes in Poland known from the literature. In order to perform the analyses in an even wider range of variability of ecological factors, the study was also performed on a few salt marshes in Germany. In the first stage, habitat properties of the studied sites of halophytes were analysed. In the next stage, a general vegetation pattern was investigated and the importance of different salinity measures for the development of this pattern was compared. Ecological spectra of species occurring in salt marshes were analysed based on the salinity measure that was most important for the vegetation pattern. The subsequent analyses were carried out in order to investigate whether the species composition and cover-abundance of species in vegetation patches are related to the intensity of influence exerted by particular environmental variables. For this purpose, the studied patches were grouped. It was analysed which environmental factors are most important in differentiation of the distinguished groups, and what is the relationship between their occurrence and the local environmental conditions.